Running numbers: 1400 - 1474, 5800 - 5819. 1933 (5800 - 5819) to lot number 279. This pretty class of engines were designed to replace the Wolverhampton '517' class, which by 1932 was looking well past their best. Charles Collett kept the design very much in the form of it's predecessor but with modern refinements. 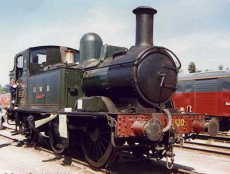 The boiler was of the Group 7 SS type, still carrying a dome but with a pressure of 165 p.s.i., whilst the cab was fitted with large windows front and back. When introduced, the first class were numbered 4800 to 4874 with the later class numbered 5800 to 5819. The differences between the two classes was that the '4800' class was built with auto gear for working with trailer cars and was fitted with A.T.C., whereas the '5800' class were not, although some members of the class received A.T.C. equipment later. 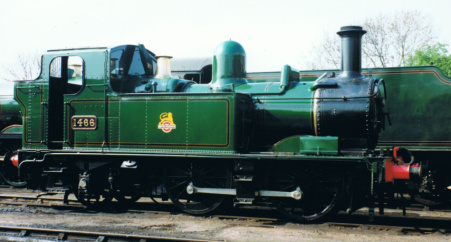 When plans were put forward for converting some GWR engines to oil burning, it was decided that the modified '2800' class would be renumbered in the 4800 series. Therefore the original '4800' class was renumbered 1400 to 1474. As the branch lines closed so these little engines lost their jobs and withdrawals began to appear in 1956. The last four working examples of the '1400' class were withdrawn in November 1964, however the '5800' class had already disappeared by April 1961. Four members of the '1400' class have been lovingly preserved and their numbers are 1420, 1442, 1450 and 1466.